After an unruly crowd disrupted the release of Apple's iPhone 4S at its flagship location in Beijing, Apple has decided to postpone the sale of its best-selling handset at its official retail locations in China, though the device will still be available through its carrier partner and authorized resellers [updated]. Update: Apple has confirmed in a statement to AllThingsD that it will delay sales of the iPhone 4S at retail locations in Beijing and Shanghai. Apple retail staff at the Sanlitun Apple Store in Beijing put signs out Friday afternoon with a note saying, "This store will not be selling the iPhone in the recent future." Apple had previously announced that the iPhone 4S would go on sale at its Sanlitun retail store in Beijing at 7AM local time (6PM Eastern), but altercations between scalpers and line-waiters have allegedly delayed the launch. As of 8AM, the store had yet to open. The imminent launch of Apple's latest handset in China had attracted thousands of customers outside the company's five stores throughout the country. Security barricades had originally been set up to manage the crowd at the Sanlitun store earlier in the week, but they were taken down sometime on Thursday night or Friday morning. 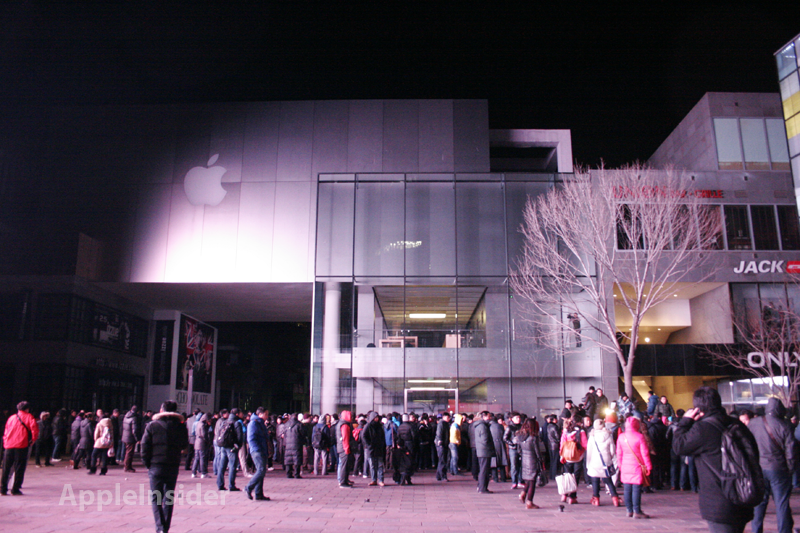 Remnants of the crowd outside Sanlitun Apple Store in Beijing early on Friday, Jan. 13. One journalist on location in Beijing claimed that Apple had canceled the launch because fights had broken out during the night, while some crowd members claimed Apple would take orders for the iPhone 4S at the store on Friday without distributing the devices. Groups of professional line-waiters and scalpers could be seen congregating outside the store early Friday. As the 7AM launch time came and went without Apple opening its doors, a number of them became disgruntled. Shouts of "Open the door!" rang periodically rang throughout the crowd. At one point, a group of unhappy line-waiters left shouting profanities at Apple. Several individuals were forcefully escorted away by security officials, though it was not immediately clear why they were being removed. Bloomberg reported on Friday that some angry customers pelted the Apple Store with eggs after it was revealed that the device would not go on sale. According to the publication, the Apple Store in the Pudong district of Shanghai opened an hour early and has begun selling the iPhone 4S. 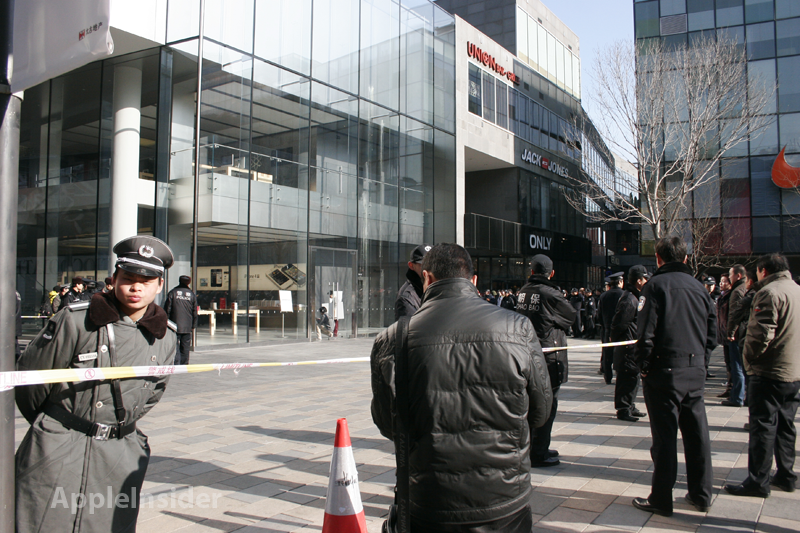 Police officers cordoned off the Sanlitun Apple store in Beijing on Friday. The 16GB iPhone 4S is selling for 4,988RMB ($790) on Apple China's online store, while the 32GB and 64GB models sell for 5,888RMB and 6,788RMB, respectively. Estimated shipping time is currently two weeks. China Unicom is also offering iPhone 4S for free with a multi-year contract on plans starting at 286RMB ($45). The well-organized secondary market in Beijing has led to conflicts at the Sanlitun store in the past. Last year, the release of the iPad 2 and white iPhone 4 was marred by an incident that resulted in a broken glass door and several injuries. In addition to China, Apple is scheduled to launch the iPhone 4S in 21 more countries on Friday.